Nancy grew up near the bay in Ocean County, NJ. Having a love for animals, she “bunny sat” for neighbors while they were on vacation and accompanied her senior neighbor on long walks in the summer, to help with her poodle. She has spent most of her life caring for animals, having dogs growing up and hamsters, dogs and cats as an adult. After many years in the mortgage industry, Nancy lost her job. With her husband encouraging her to chase her passion, she returned to school at Camden County College. The path began, to pursue a career in a field that she had always dreamed of. 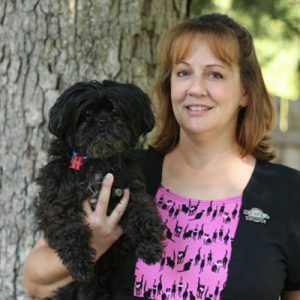 Nancy’s instructor gave her great guidance when job hunting, “You have to really believe in the place you work for.” Those words were what led Nancy to become part of the HousePaws Homies. “Being a part of an awesome team that treats our patients like our own fur babies, is what it is all about.”, says Nancy. Nancy lives near our Atco office with her husband, Emil and her three dogs Obi (Nigerian meaning “heart”) and Dabi (Hebrew meaning “dearly loved”) and Licorice, a senior that she rescued who was already named. She spends her free time transporting rescue animals from South Geogia with Animal Aid USA or volunteering for Operation Safe Haven, a tiny home community for homeless Veterans.